Submitted photos Wright State completed the 2017-2018 year with an April 10 blood drive that ultimately called for 38 donors — including a dozen first-time donors — with 33 donations for 150 percent of the collection goal. The April 10 blood drive was the sixth blood drive of the 2017-2018 school year, doubling the number of blood drives in 2016-2017. The six blood drives totaled 258 donors, including 90 first-time donors and 201 blood donations for 118 percent of goal. FAIRBORN — There’s a success story at Wright State University that might have been overlooked during a championship basketball season and challenging budget cuts — the Raiders are quietly building a reputation for helping save lives with their award-winning campus blood drives. Community Blood Center is honoring both Wright State University and the Boonshoft School of Medicine with Platinum awards in the 2017 LifeSaving Ambassadors Club for blood drive excellence. Platinum is the highest honor to blood drive sponsors for achieving 100 percent or more of collection goals. Compare blood drive performance during the school year of 2016-2017 to the current year, and the turn-around is dramatic. Wright State completed the 2017-2018 year with an April 10 blood drive that ultimately called for 38 donors — including a dozen first-time donors — with 33 donations for 150 percent of the collection goal. 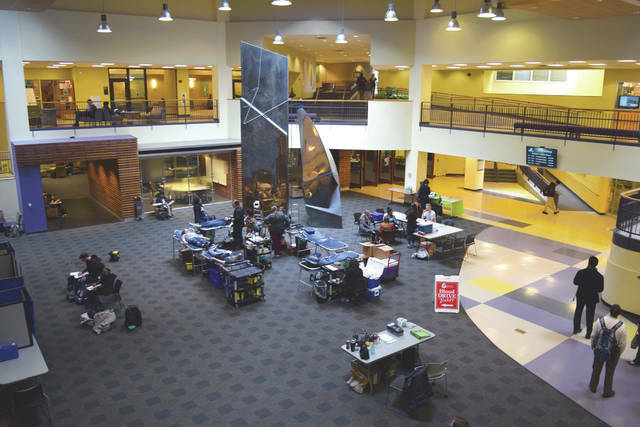 Wright State not only doubled the number of blood drives from the previous year, it also increased number of donors by 118 percent. Meanwhile, the Boonshoft School of Medicine went from one blood drive in the 2016-2017 school year to four in the current year. Boonshoft totaled 125 donors, 52 first-time donors and 97 donations for a 111 percent of collection goal, a 681 percent increase. The Association of Student Nurses co-sponsored the April 10 Wright State blood drive with the honors program and sponsored a blood drive in the fall. Senior student Alex Vaughn started donating in high school and continued at Wright State. She made her sixth lifetime donation Tuesday. Sam Tendam stopped by the April 10 blood drive to make his second lifetime donation. He belongs to Sigma Phi Epsilon, a fraternity that encourages members to contribute community service hours. Donors are required to provide a photo ID that includes their full name. Past CBC donors are also asked to bring their CBC donor ID card. Donors must be at least 17 years of age (16 years old with parental consen), weigh a minimum of 110 pounds (or more, depending on height) and be in good physical health. Connect with Community Blood Center for the latest information and services at www.GivingBlood.org. Get fast and complete answers on how to make your first donation, organize a blood drive, or bring our education program to your school. Get all the updates in the CBC/CTS newsroom, find quick links to our social media pages, For more information or to schedule an appointment to donate visit www.DonorTime.com. 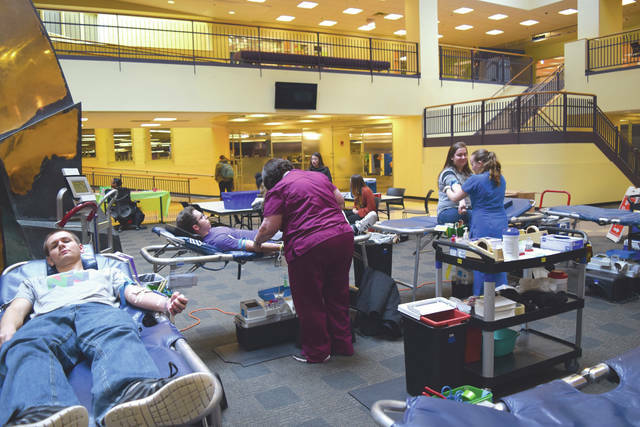 https://www.fairborndailyherald.com/wp-content/uploads/sites/50/2018/04/web1_WSU-Atrium-Blood-Drive.jpgSubmitted photos Wright State completed the 2017-2018 year with an April 10 blood drive that ultimately called for 38 donors — including a dozen first-time donors — with 33 donations for 150 percent of the collection goal. https://www.fairborndailyherald.com/wp-content/uploads/sites/50/2018/04/web1_Wright-State-donors.jpgThe April 10 blood drive was the sixth blood drive of the 2017-2018 school year, doubling the number of blood drives in 2016-2017. The six blood drives totaled 258 donors, including 90 first-time donors and 201 blood donations for 118 percent of goal.